Learning leaders often act as performance consultants to stakeholders in their organizations, and consulting is one of the key competencies in the Training Manager Competency Model™. By acting as a consultant, learning leaders can be strategic partners to other business leaders and ensure that training programs are aligned to business needs. Simply put, performance consulting consists of identifying a business need, its cause(s) and the training strategy (if applicable) that can meet that need. Importantly, not all business problems can or should be solved with training; therefore, identifying whether training is a possible or good solution is an important step in the performance consulting process. For example: The IT department head meets with the L&D leader because there has been an increase of unsafe email practices among employees in multiple departments. She requests organization-wide cybersecurity training from the L&D leader. As a performance consultant, the L&D leader’s first step is to determine what is causing employees to use unsafe email practices, so he can decide if training will change the behavior. He can find out by conducting a needs analysis, perhaps talking to some of the employees affected by the problem, asking them questions and actively listening to their answers. He may find that employees are aware of the importance of cybersecurity, but they simply need a reminder of what steps to take to protect their data. In that case, a job aid containing red flags to look out for and password tips might be all that is needed. On the other hand, if employees are completely unaware of the danger of cybercrime and email phishing, they may need some training to improve their awareness and teach them how to protect themselves and the company. If the business problem doesn’t require training, performance consulting can keep the organization from spending valuable time and money developing and implementing training that isn’t needed. On the other hand, if the problem’s solution does require training, taking a different step can keep the business from being as successful as it can be. 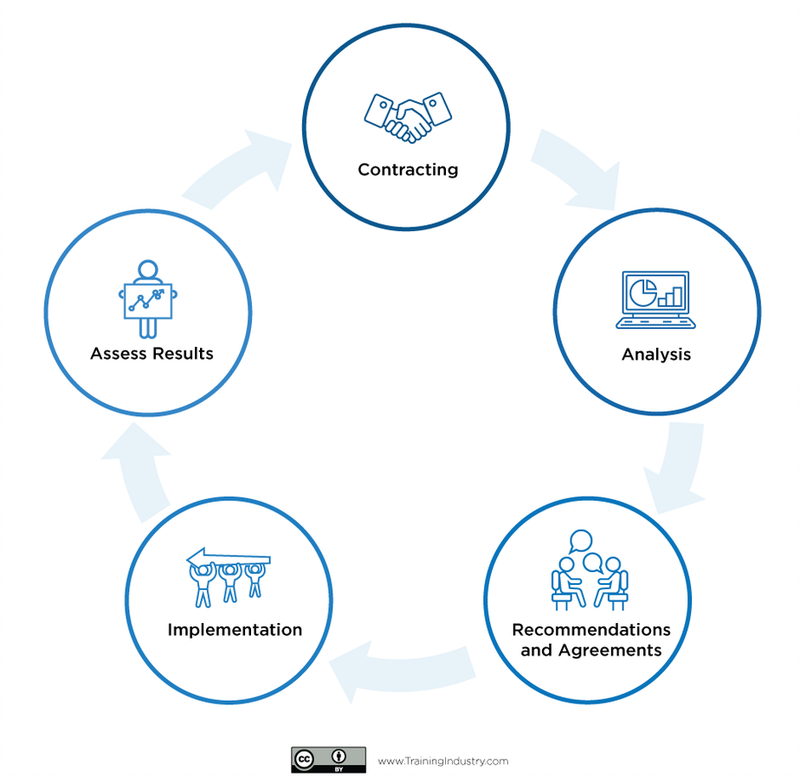 Training Industry has identified five phases of performance consulting, which create a continuous cycle of activity: contracting, analysis, recommendations and agreements, implementation, and assessing results. Learning leaders can follow these recommendations to be good performance consultants in their organizations. Avoid being an order-taker. Never assume training is the solution to a problem. Instead, collect data to identify the true need. Develop your consulting skills, including the ability to identify issues, define roles, communicate solutions and obstacles, negotiate solutions, define and measure success, and provide and receive feedback. Being a good performance consultant also requires strong business acumen. Manage relationships. Depending on the circumstances, you may be working with a stakeholder or with a person who reports to a stakeholder. The ability to work well with both roles is essential to good performance consulting. Be an active listener. Listen to learners and business partners. Listen for information and to develop a better understanding of needs. Listen both to what they’re saying and how they’re saying it. Show that you’re listening with your body language, ask follow-up questions and don’t make quick judgments. Measure and report results. Data informs more productive conversations with stakeholders and helps you make decisions on learning strategy now and in the future. Learn about Training Industry’s internal consulting master class here.